Peace it Together organized and hosted "Struggling with Peace: Grounding peace work in action and change," a special two-day public symposium featuring expert peace builders from Israel and Palestine. The symposium focused on critiques of joint peace-building programs, how peace builders respond, and the ways practitioners have adapted their programs to create a meaningful impact and address valid concerns. It also explored how peace builders and organizations can use art as a mechanism for exploring conflict, and how individuals can take action for real change. By organizing this symposium Peace it Together joined an important ongoing conversation on the international level about people-to-people peace building, its shortcomings and best practices. By hosting experts from Israel and Palestine in Vancouver Peace it Together was able to help its local supporters more deeply understand the complexities of peace-building work between Palestinians and Israelis, while forming stronger connections with these partners in the region. For the first time each delegation was supported by a regional staff member for the 11-18 months following the summer intensive. Youth were empowered and trained to use their films to lead workshops, and to facilitate dialogue about the conflict. Regional Coordinators supported the youth to build on their creative facilitation, conflict transformation and public speaking skills, and helped them effectively host challenging and in-depth dialogues with others. Together the Israeli, Palestinian and Canadian youth screened their films and led dialogue with almost 3,000 people in their own communities. This represented a significant expansion to Peace it Together�s program, and strengthened its long-term impact on participants as peace builders. The new community-engagement component provided the organization with the opportunity to engage with youth in critical conversations about their experience in the program. It also helped Peace it Together better understand youth�s individual perspectives of the conflict and the issues connected to it, and what they needed from the organization in order to feel empowered as peace builders, able to take action and foster cultures of peace. In 2011 Peace it Together offered its program to an older demographic for the first time: university students in their 20s. A new cohort of 30 youth participated in the summer intensive, with dialogue taking place in Pemberton BC, and filmmaking at the University of British Columbia. The more diverse lived experiences and insights of this slightly older group enriched the dialogue and filmmaking processes, deepening the impact of the summer intensive. A professional film team produced seven compelling behind-the-scenes films capturing the youth�s experiences. For this program Peace it Together partnered with the Peace Research Institute in the Middle East (or PRIME) to forge relationships in Israel-Palestine, select and prepare Middle East youth for the program, and help implement the new community-engagement component of the program, in which youth screened their films in creative workshops in their home communities. This dramatic expansion of Peace it Together�s work was made possible by two grants from the Department of Foreign affairs and International Trade (DFAIT, at the time), and Citizenship and Immigration Canada (CIC). This was the first time Peace it Together was awarded government funding. In 2008 Peace it Together replicated the dialogue and filmmaking intensive with a new cohort of 30 youth at a different venue on Canada's West Coast. The level of dialogue in the program was deepened and the technical quality of the films improved as Peace it Together and its skilled staff further refined our unique approach to peace building. Post-summer activities continued as they did after the 2006 summer intensive. Peace it Together continued to receive coverage and recognition for its programming. 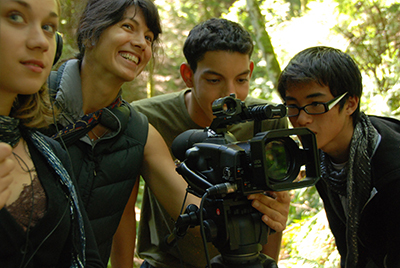 In the summer of 2006 Peace it Together worked with the Gulf Islands Film and Television School (GIFTS) to create a new core framework, incorporating an intensive filmmaking component to the program. 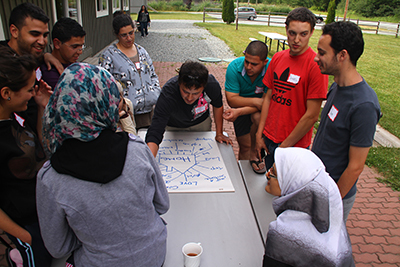 Twenty-nine youth (ten Palestinian, ten Israeli, and nine Canadian) engaged in intensive dialogue sessions led by trained facilitators. With guidance from film professionals and mentors, tri-national groups (containing a Palestinian, an Israeli, and a Canadian in each) then created short films together about the conflict. The filmmaking process provided participants with a hands-on experience in co-creation and negotiation, while deepening dialogue about the conflict. The films were well received by people in the region and around the world. After the summer program, volunteer coordinators helped reunite the Palestinian and Israeli delegations, and some of the youth shared the films with their communities and/or at international conferences. The Canadian youth, with limited support from the Peace it Together staff, screened their films in a variety of local settings, including a number of high schools. Peace it Together and Redstorm Production produced and distributed an educational DVD, Peacing it Together, featuring the youth-made films, a 30-minute behind-the-scenes film, interviews with youth and footage from some workshops. Known in 2004 as the Creative Peace Network, Peace it Together's inaugural program was a summer camp for 12 Palestinian, Israeli and Canadian teenagers, utilizing team-building, dialogue, outdoor adventures, art activities and other forms of creative exploration to help participants transform stereotypes, learn skills and develop compassion for their "enemy." One of the recommendations from an extensive evaluation process identified the need for -and benefits of - centering the program on a creative activity through which youth could co-create something tangible together. The program was featured in several local newspapers. Since its founding ten years ago, Peace it Together’s programming and approach to peace building has continually evolved so as to best serve youth and advance peace in Israel and Palestine, through dialogue and filmmaking. Over the years, the films created by Peace it Together youth were accepted by multiple international film festivals, and won several awards, and Peace it Together has been recognized for its contributions to the field of peace building. 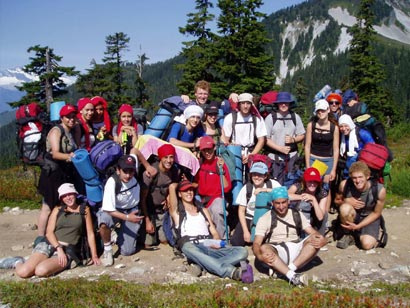 Known in 2004 as the Creative Peace Network, Peace it Together’s inaugural program was a summer camp for 12 Palestinian, Israeli and Canadian teenagers, utilizing team-building, dialogue, outdoor adventures, art activities and other forms of creative exploration to help participants transform stereotypes, learn skills and develop compassion for their “enemy.” One of the recommendations from an extensive evaluation process identified the need for, and benefits of, centering the program on a creative activity through which youth could co-create something tangible together. The program was featured in several local newspapers. In the summer of 2006 Peace it Together worked with the Gulf Islands Film and Television School (GIFTS) to create a new core framework, incorporating an intensive filmmaking component to the program. Twenty-nine youth (ten Palestinian, ten Israeli, and nine Canadian) engaged in intensive dialogue sessions led by trained facilitators. With guidance from film professionals and mentors, tri-national groups (containing a Palestinian, an Israeli, and a Canadian in each) then created short films together about the conflict. 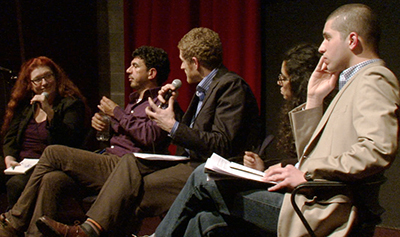 The filmmaking process provided participants with a hands-on experience in co-creation and negotiation, while deepening dialogue about the conflict. The films were well received by people in the region and around the world. After the summer program, volunteer coordinators helped reunite the Palestinian and Israeli delegations, and some of the youth shared the films with their communities and/or at international conferences. The Canadian youth, with limited support from the Peace it Together staff, screened their films in a variety of local settings, including a number of high schools. Peace it Together and Redstorm Production produced and distributed an educational DVD, Peacing it Together, featuring the youth-made films, a 30-minute behind-the-scenes film, interviews with youth and footage from some workshops. In 2008 Peace it Together replicated the dialogue and filmmaking intensive with a new cohort of 30 youth at a different venue on Canada’s West Coast. The level of dialogue in the program was deepened and the technical quality of the films improved as Peace it Together and its skilled staff further refined our approach. Post-summer activities continued as they did after the 2006 summer intensive. Peace it Together continued to receive coverage and recognition for its programming. In 2011 Peace it Together offered its program to an older demographic for the first time – university students in their 20s. A new cohort of 30 youth participated in the summer intensive, with dialogue taking place in Pemberton BC, and filmmaking at the University of British Columbia. The more diverse lived experiences and insights of this slightly older group enriched the dialogue and filmmaking processes, deepening the impact of the summer intensive. A professional film team produced seven compelling behind-the-scenes films capturing the youth’s experiences. For this program Peace it Together partnered with the Peace Research Institute in the Middle East (or PRIME) to forge relationships in Israel-Palestine, select and prepare Middle East youth for the program, and help implement the new community-engagement component of the program, in which youth screened their films in creative workshops in their home communities. This dramatic expansion of Peace it Together’s work was made possible by two grants from the Department of Foreign affairs and International Trade (DFAIT, at the time), and Citizenship and Immigration Canada (CIC). This was the first time Peace it Together was awarded government funding. For the first time each delegation was supported by a regional staff member for the 11-18 months following the summer intensive. 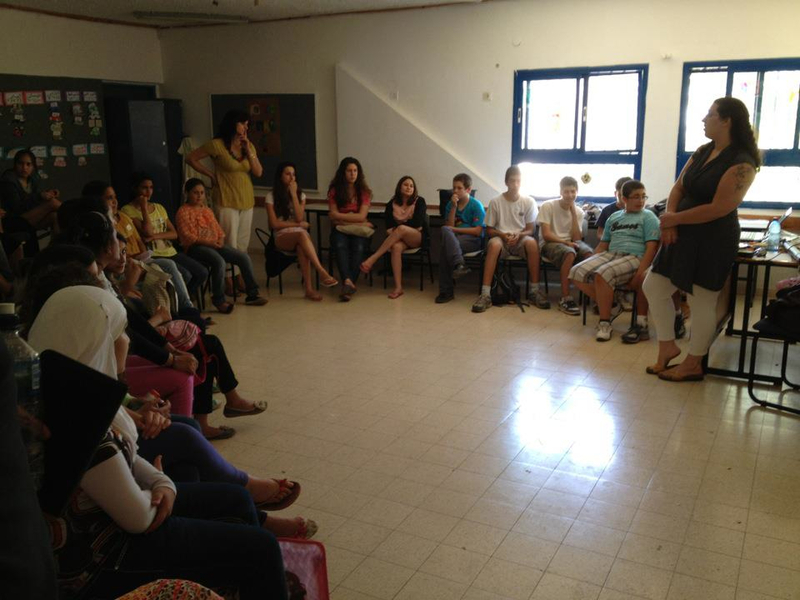 Youth were empowered and trained to use their films to lead workshops, and to facilitate dialogue about the conflict. Regional Coordinators supported the youth to build on their creative facilitation, conflict transformation and public speaking skills, and helped them effectively host challenging and in-depth dialogues with others. Together the Israeli, Palestinian and Canadian youth screened their films and led dialogue with almost 3,000 people in their own communities. This represented a significant expansion to Peace it Together’s program, and strengthened its long-term impact on participants as peace builders. The new community-engagement component provided the organization with the opportunity to engage with youth in critical conversations about their experience in the program. It also helped Peace it Together better understand youth’s individual perspectives of the conflict and the issues connected to it, and what they needed from the organization in order to feel empowered as peace builders, able to take action and foster cultures of peace. Peace it Together organized and hosted Struggling with Peace: Grounding peace work in action and change, a special two-day public symposium featuring expert peace builders from Israel and Palestine. The symposium focused on critiques of joint peace-building programs, how peace builders respond, and the ways practitioners have adapted their programs to create a meaningful impact and address valid concerns. It also explored how peace builders and organizations can use art as a mechanism for exploring conflict, and how individuals can take action for real change. By organizing this symposium Peace it Together joined an important ongoing conversation on the international level about people-to-people peace building, its shortcomings and best practices. By hosting experts from Israel and Palestine in Vancouver Peace it Together was able to help its local supporters more deeply understand the complexities of peace-building work between Palestinians and Israelis, while forming stronger connections with these partners in the region.